The Conference Schedule is now available to download here (PDF). For the conference registration please complete and send the booking form to katrin.joost@cumbria.ac.uk and diane.latimer@cumbria.ac.uk. The form can be downloaded here (word) and here (PDF). According to the Office for National Statistics (2009) almost 80% of rural space in England is inhabited (and worked) by less than 20% of the population (slightly different percentages for Scotland and Wales). Modern and contemporary arts and thought represent and reflect on urban life as an environment most of us inhabit. Consequently, contemporary life is often understood as a synonym with urban existence. Yet, the space of Britain, as an example within Europe, consists primarily of countryside. There are arguably vast unrepresented and unseen spaces and places. This apparent lack of artistic and philosophical attention to the contemporary rural space can be said to have led to an alienation of country life. We have all seen idealised pastoral images used as a shorthand representation of farmland and the countryside. This romanticisation also underpins environmental dreams of purifying country retreats and smallholdings free from environmental guilt. Rural spaces tend to be seen as loci of escape from the human condition rather than expressing it. Consequently they are seldom the focus of cutting edge arts practice and display. However, the countryside is arguably an industrial space inasmuch as it is the location of food production and an ever increasing tourism economy, and therefore as much part of the same economic reality as urban work realms. Rural space is consequently a facet of the contemporary life-world, yet arguably not represented as such. 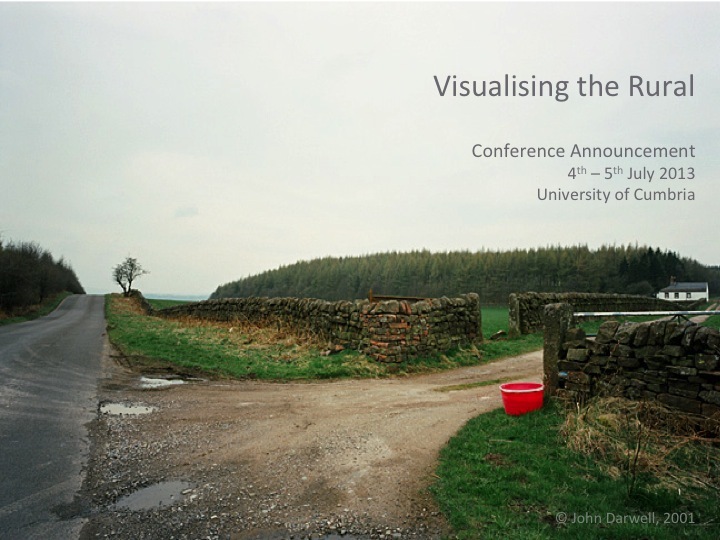 This conference aims to provide a platform for an interdisciplinary debate questioning the meaning of the contemporary rural landscape seen through photography. What does it mean to live in rural space? Does or can photography shape our understanding of the rural? What does the rural realm mean to the urban population? How do we view and evaluate rural depictions within the context of the wider contemporary art world? The Crown Gallery in Carlisle is putting on a parallel exhibition to the conference echoing the conference theme. They are now open for artists' submissions. Details can be found here.